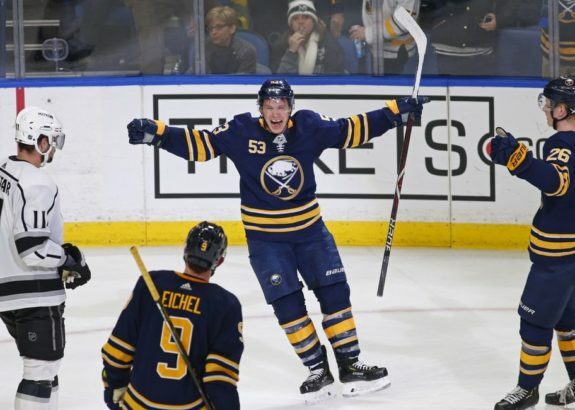 BUFFALO, N.Y. — Jeff Skinner scored a power-play goal 1:49 into overtime and the Buffalo Sabres overcame a 3-1 deficit in the third period to beat the Los Angeles Kings 4-3 on Tuesday night. Jack Eichel had a goal and an assist, and the Sabres snapped an 0-3-2 skid that immediately followed Buffalo’s franchise record-tying 10-game winning streak. Skinner scored his team-leading 21st goal eight seconds before the Kings killed off Oscar Fantenberg’s holding penalty. Eichel’s shot from the left circle was blocked in front. The puck dribbled to Sabres defenceman Rasmus Ristolainen at the left post, where he fed a pass through his legs to Skinner, who swept it into the open right side. Kings rookie goalie Calvin Petersen stopped 43 shots in his first meeting against the team he jilted to become a free agent 18 months ago. He was the Sabres’ fifth-round pick in the 2013 draft, but declined to sign with Buffalo to instead pursue free agency and sign with Los Angeles on July 1, 2017, following his junior season at Notre Dame. Aside from playing on consecutive nights, following a 3-1 loss at Detroit, the Kings were down to four defencemen. Drew Doughty did not return after sustaining an upper-body injury late in the first period. Dion Phaneuf did not return after two periods due to an upper-body injury. The boos that followed the Sabres off the ice at the end of the second period turned to cheers when Eichel and Larsson scored less than four minutes apart to tie the game at 3. Eichel snapped a shot in from the left circle by beating Petersen on the short side to cut the lead to 3-2 at 3:47 of the third period, and seven seconds after Los Angeles’ Derek Forbort was penalized for hooking. Buffalo defenceman Lawrence Pilut set up the tying goal at 7:23, when his shot from the right point banked in off Larsson’s skate as he was driving to the front of the net. Miscues and defensive lapses by the Sabres led to the Kings building a 3-1 lead. Buffalo stood around and watched as Anze Kopitar dug a loose puck out from the side of the net and fed Muzzin, who snapped a shot through a crowd from the left circle to open the scoring 6:11 in. With the game tied at 1, Eichel’s turnover at the Kings blue line led to Luff’s goal. Muzzin flipped the puck high through the neutral zone. Rather than use his glove, Sabres rookie defenceman Rasmus Dahlin muffed an attempt to bat the puck away with his stick, allowing Luff to skate in alone and backhand a shot over Ullmark 52 seconds into the second period. A series of mistakes led to Kempe’s goal some six minutes later. Kempe shook off Casey Mittelstadt and avoided Conor Sheary’s weak poke check to circle into the slot, where he snapped a shot inside the right post. NOTES: Sabres G Carter Hutton served as the backup after missing one game with an upper-body injury. … The Sabres assigned D Matt Hunwick to Rochester of the AHL on a rehab assignment, his next step in recovering from a neck injury sustained before training camp. … Kings D Alec Martinez missed his second straight game with an upper-body injury.